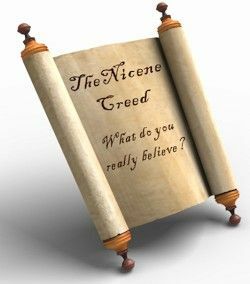 Every Sunday in Mass, we utter the Nicene Creed, a summary of Christian beliefs. 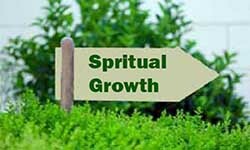 When we pay attention to the words we recite, our faith can grow. In Mark 12:28-34, Jesus gives us that so-familiar commandment to love God with all your heart, soul, mind, and strength, and to love your neighbor as yourself. In this examination of the Nicene Creed, we can discover where our faith still needs to grow. The depth of faith is revealed by how we love, not by what we profess to believe. If I truly believe that God is the Father of all, I respect and love every person as a brother or sister. I have no prejudices, I refuse kindness to no one, I remember that God loves even the most evil person as much as He loves the holiest person, and I feel secure knowing that He loves me as much as He loves others. If I truly believe that Jesus is God and that He and the Father are one, I love Him so much that I cling to every Word He speaks in scripture, I want to learn from His example, and I follow Him everywhere, trusting Him totally as He leads me anywhere He desires to take me. If I truly believe this, I love all of creation. I am a good steward of the natural world, of the relationships He has formed in my life, of the gifts and talents with which He has made me, of the time He has allotted for my life, and of the money He has given me the ability to earn. If I truly believe that God became man, I love Jesus as my closest, dearest brother, and I treasure each member of the human race as brothers and sisters, realizing that we are united to each other even if they don’t know Jesus. And if I truly believe that God became man through a woman, I love that woman as my own Blessed Mother. If I truly believe that Jesus did all this for my sake, I will embrace the cross. I will know that I am forgiven for everything that I remorsefully confess, and therefore I love myself freely. And if I truly believe that Jesus did all of this for the sake of everyone, I will forgive others, without reservation, without delay, loving them as He loves them. I will embrace my own cross for their sake, loving them while loving myself, joining my sufferings to Christ’s, and trusting that God will eventually resurrect each situation into a glorious victory. If I truly believe in the Holy Spirit, I love the life He has given me and I know that I am important. I also value everyone else’s life as precious, including unborn babies, the handicapped, the elderly, and even the criminally insane. If I truly believe this, I read scripture as a love letter from God to me, as a guide book, and as the truth. I am eager to read the Word daily, because it always draws me closer to God and teaches me how to live. I love the Body of Christ! If I truly believe that the Church is holy, I know that I am holy, because I am Church; I love myself and my neighbor so much that I want to live out my holiness better and better each day. If I truly believe that the Church is catholic (universal), I know that everyone else who is Church is also holy, and therefore I lovingly honor and respect them, even when I can’t see their holiness. If I truly believe that the Church is apostolic, I love Mother Church and her apostolic succession from St. Peter to today’s pope and priests, but I also love my own calling to be an apostle, for I know that I have been sent forth to bring God’s kingdom into the world. If I truly believe this, I love every Christian of every denomination and I hold no grudges against them, not even when their religious practices differ from mine or when they reject my expressions of faith and refuse to understand my religious practices. I also love and accept the non-baptized who are Christian by the baptism of desire or the baptism of blood (martyrdom). Since I believe everything spoken above, loving God with all my heart, soul, mind, and strength, and loving my neighbor as myself, if I truly believe that Jesus opened the door to heaven for me, I have full confidence that I will someday join the saints in heaven and I will be reunited with my loved ones who have gone there in faith before me. I realize that I am even now mystically united with all the saints on earth, in purgatory and in heaven, and I freely share my love with them, praying for them and with them, doing whatever I am capable of doing to give and receive true love. To the best of my abilities, with God’s help!